Safety is always the first worry of a tourist who intends on renting a car in a foreign country. So let us immediately get to the point: you will be fine. Every year, thousands of tourists rent a car at Malaga Airport. If anything, this large number of foreigners on the roads of the Costa del Sol, makes them safer. Spaniards may be known to be as ‘vibrant’ on the road as they are anywhere else, this does not apply to the many, very many visitors who are here for the first time, and consequently have a more cautious driving style – especially the British, who are used to driving on the other side of the road. And here’s a piece of information that might make you feel more relaxed: with some exaggeration, we could say that there’s only one road at the Costa del Sol: the A7 Motorway. You will definitely get to know this motorway. It stretches all along the Costa del Sol, from Malaga to Algeciras, parallel to the sea. So every time you want to get from one coastal town to another, you can go over this A7. 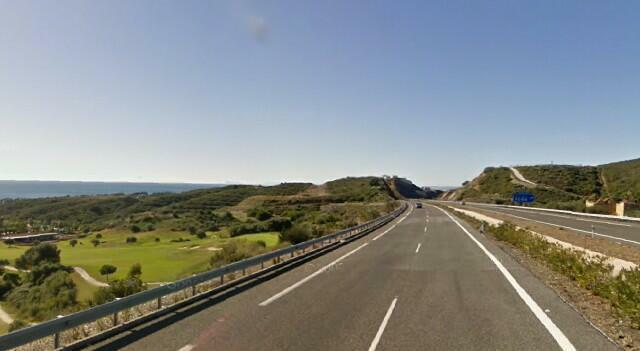 Moreover, you can decide to choose its newer version, the toll road AP-7 or the ‘Autopista del Mediterraneo’. Both the A7 and the AP7 run parallel or intertwine, over the whole length of the costa, so you can alternate or decide to get on or off the toll road. When you leave this motorway, the rule of thumb is: on the side of the sea it’s busy, on the side of the mountains more tranquil. And obviously, the more you drive inland, towards or over those mountains, the more empty the roads are. Which makes for magnificent driving experiences! The driving style in the towns, such as Torremolinos, Fuengirola, Marbella or Estepona is not much different than in similar towns anywhere else in Europe. Also here you might mainly stick to the main avenues, or try to find a parking spot in more narrow side streets – unless you immediately head for one of the many undercover parkings, indicated by the blue P-sign. So, you will be fine. Don’t do anything you wouldn’t do at home, and use your first day to learn to get used to the flow of the region. One thing: for those who are not used to roundabouts, there are many of them in Spain! And the rules are as follows: the driver who is already in the roundabout has the right of way, unless there are traffic lights at the roundabout that govern the flow of traffic. Before you leave the roundabout, you should turn your right turn signal indicator to indicate that you are leaving the roundabout. Having your own rental car means having the freedom to explore. We wish you a great stay in our beautiful region! Hi Guys, we are looking to hire a car from Malaga Airport for 5 days (13/2/17-17/2/17) we are a family of 5 (2 Adults 3 kids) while we are staying in Mijas area we are planning to travel to Cordoba, Granada and Gibraltar, can you kindly let me know prices with full insurance please. After choosing your car you can select the Full Pack rate to add full insurance. Remember that there is a surcharge for visiting Gibraltar, amounting 9 €/day, with a minimum of 27 €. TI am thinking of hiring a car on June the 19th, do you have pro vouchers ?